While I like seeing other plants develop in the spring - what could be prettier than the various shades of green10 as trees begin to form buds, then leaves and blossoms on the fruit trees - I long ago decided that strawberries are my favorite plants to watch develop following winter11. Because of the severe winter in this part of the U.S. it is necessary to place a protective layer12 of straw or leaves over the dark green mature13 plants. When one begins to see the bright green plants poke14 their heads through their winter bedding15, it is a sure sign of spring arriving. As spring advances16, one next sees the strawberry leaves turn dark green, and within a month or so, the beautiful white blossoms17 appear like a dusting of snow18 on the green plants. Flowers give rise to19 the strawberry fruits - actually the fruits are small seeds embedded20 in the receptacle21, the base of the flower - so this is a multiple berry22 fruit. The receptacle tissue enlarges and becomes white to light yellow within another week, and finally the brilliant red23 color replaces the lighter hues24 to form the nearly conical25 strawberry with the lighter color seeds imbedded20 in the receptacle. This year we had lots of moisture26, and the berries are larger than usual, and the taste is milder and sweeter than usual. From my youth I remember this as one of the truly most delightful tastes27 of any food. If one takes a ripe berry directly from the plant, places it in the mouth, and slowly chews28 the berry, there is that delightful fruity taste which is accompanied by the fresh scent29 which is detected immediately in the nose. Maybe it is just because the strawberry is one of the earliest of berries found in the year, and while I like berries of almost any sort, none has a more delicate30 taste to me than a strawberry. One can eat strawberries in a number of ways and enjoy them. I think one of the best ways, other than eating them fresh31, is to make strawberry shortcake32 by placing spoonfuls of fresh strawberries over a small, flat cake, and perhaps topping this with a bit of whipped cream33, or ice cream. This is as much a rite of spring34 as the first robin35 appearing in the yard! Some people prefer fresh strawberries with cream, or strawberries on waffles36 with syrup, strawberries in jam or jelly, etc. I also like strawberry pies, but when I was very young, I learned that strawberries on peanut butter and bread was a delicious treat37. I still like to try that each spring! 1. spring season: April to June in northern U.S. areas (春季，美国北部为四至六月). 5. plow: turn over the earth so that seeds can be planted (耕地，翻土). 6. typical vegetables: common vegetables grown in the Midwest (有代表性的蔬菜). 10. various shades of green: different degrees of green from light to dark, etc. (不同深浅度的绿色). 12. protective layer: a covering of insulating material such as straw or leaves to prevent damage during the severe winter weather (保护层，用草、叶子铺成，避免在严冬中冻坏). 13. mature: of a fully developed stage of growth (成熟期的). 14. poke: push up through the covering layer of straw or leaves (露出，伸出). 16. as spring advances: as the spring develops seasonally (随着春天的脚步不断向前). 17. blossoms: the flowers of a plant (植物的花). 18. a dusting of snow: a light covering of snow (一层薄薄的雪). 19. give rise to: be the reason why something happens (引起，导致). 20. embedded (imbedded): put something firmly and deeply into something else (嵌入，插入). 21. receptacle: the base of the flowering stem to which the other parts of the flower are attached (花托). 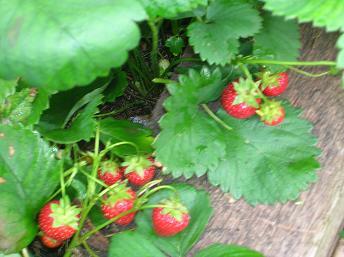 22. multiple berry: a fruit in which many berry seeds are formed within or on the fleshy receptacle tissue (多籽莓). Other fruits of this type include blackberries, raspberries, and mulberries. 23. brilliant red color: bright, shining red color (艳红色). 25. conical: cone-shaped with greater width at the base and narrowing to the top (锥形的). 29. scent: odor or smell detected by the nose (气味). 30. delicate: very subtle, not overwhelming, pleasant and not strong (淡雅的，清淡的). 32. strawberry shortcake: cake over which strawberries are poured and often with whipped cream or ice cream on top (草莓奶油酥饼，草莓冰淇淋酥饼). This is a very popular springtime dessert. 33.whipped cream: heavy rich cream which is beaten by a fork or mixer until it thickens because of air combined within the cream (掼奶油). 34. rite of spring: a ritual or event which repeats each year (春天的典礼、仪式). 35. first robin: the first sighting of a robin, a bird often associated with the arrival of spring (看到的第一只鸫，常与春天的到来连在一起). 37. treat: something that is very special to eat; not an ordinary food item (非常好吃的东西). 38. rank: be placed or rated in a definite order from top to bottom (具有……等级). We like to cook using our outdoor grill1 when the weather is nice. It is located2 outside the door leading to our office area and is quite convenient3 for us. We have a cement patio4 there and even if the yard is a little muddy5 sometimes, we can grill without getting our feet dirty too. We have enjoyed grilling for many years. Our first grill was a small hibachi16 grill that we would use in our back yard. It cooked the food with charcoal. Later, when we wanted a larger grill, we purchased a large gas grill which was supposed to be efficient. However, it actually seemed to be more trouble to us because we had to replace propane fuel tanks17. Also propane is potentially more dangerous to work with than charcoal18. We also prefer the taste of charcoal grilled meat. Therefore, that’s the type of grill we have now. This past Sunday we had our first cook out of the season. 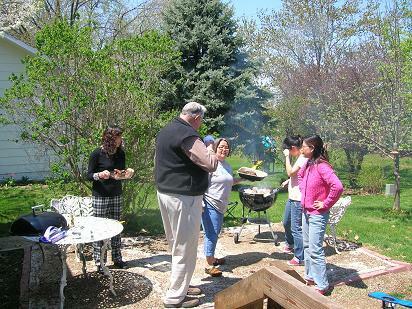 Our four good friends from Zhejiang University, Ying Hui Lan, He Lian Zhen, Xiong Hai Hong and Jiang Jing Yang, are visiting us, so we wanted to share our love of grilling with them. Kim bought chicken, bratwursts (German sausages) and hamburger to grill. We had a lot of meat, buns, coleslaw (a cabbage salad), and potato chips, a typical cook out menu. Kim got the meat ready to cook and Don did the grilling. He always enjoys doing that. The day was lovely, so after we all stuffed19 ourselves, we relaxed20 however we wished. Our four guests played cards in the yard, Don dozed21 out under a tree, and Kim and I relaxed inside the house. I feel that Spring is now officially22 here, and I’m so very pleased that our special friends from China were here with us on Sunday. 1. grill: a device in which charcoal is burned and food is cooked on a metal rack above the charcoal (烧烤用炉具). Grills come in many sizes; our present one is about 2 ft. diameter. There are cookbooks and magazines completely devoted to grilling because of its popularity. 2. located: placed or set up in a given area of choice (位于，置于). 3. convenient: useful, near at hand (方便的). 4. cement patio: a flat area paved with concrete (铺了水泥的后院). 5. muddy: having wet soil which readily clings to shoes and clothing (泥泞的). 6. grill: cook on a grill over charcoal or other fuel (烧烤). 7. Idaho: a mountainous state in the northwest part of the United States (爱达荷州，位于美国西北部，州内多山). 8. deck: a flat floored roofless area adjoining a house (与房子衔接的木制平台). 9. cookout meal: food prepared out of doors (露天烧烤的饭菜). 10. signals: is a sign that something is going to happen (表明，表示). 11. explorers: people who travel to new or unknown areas to discover new information (探险者). discovered by the Spanish and Portuguese explorers (土著印第安人). 15. barbacoa: the Spanish language term for cooking over charcoal (西班牙语的“烧烤”). 16. hibachi: a small charcoal grill or brazier, the term derived from Japanese language (手提式小炭炉，该词来自于日语). 18. propane is potentially more dangerous to work with than charcoal: 丙烷使用起来会比炭危险. 19. stuffed: (American slang) filled (填饱肚皮). 20. relaxed: rested, or remaining inactive from most movement (放松). 21. dozed: napped or slept lightly (打盹). 22. officially: generally accepted or recognized (真正地). Almost every spring since I was a child I’ve been involved one way or another with spring cleaning. My mother thought that spring cleaning had to include a complete change of curtains on all of the windows in the house where I grew up. She would take them all down, carefully launder1 them, and then tell me to dust all of the slats2 at the windows, which we called Venetian blinds3. That was a job I thoroughly hated, so needless to say, I have none of those blinds and very few curtains in my house. Still, there are spring cleaning chores4 which I always do, and which I have been doing recently. I like to go through our clothing, decide what I think we will not wear again, put those items in a very large plastic bag, and then take them to the Pella Clothing Bank5. At the Clothing Bank people can obtain needed clothing items for a very small amount of money, or even free, if they really have no money to spend. The Clothing Bank does not try to make any money, but just provide clothing for needy6 individuals. I have gone through several closets7 and we have taken about four large bags of clothing to the Clothing Bank. I always feel good about that. I have also gone through our many shelves of books and found some books that I was able to part with8. It is difficult for me to part with my books, but there are some I know I really won’t want to keep for any important reason, so these books we put in a box and took to the Pella Public Library9. Several times a year the library has a book sale. Many people donate books to be sold there at very cheap prices, and the money goes for items that the library needs, like extra book shelves, computer paper etc. As usual, I found some books that we really could part with, so Don carried a box of books to the library and left them to be sold at the book sale two weeks ago. Last week my cleaning lady and I made a thorough spring cleaning of my spice cupboard14. We checked all of the things in it, decided what spices were no longer fresh enough to use etc. The unwanted items were thrown away; they wouldn’t be good for anyone. However, I feel very good about that job because now I know what I have and also feel that everything is really fresh. Today I am cleaning another kitchen cupboard. In it I keep many small plastic food storage containers15. These containers are useful but take up a lot of space. Their lids also get misplaced16. Don and I have decided on a different way to store the containers after I have gone through them. Perhaps I won’t lose so many lids this way. Wish me luck! 1. launder: wash and iron clothes, sheets etc. (洗熨). 2. slats: thin flat pieces of wood, plastic etc. used especially in furniture (板条). 4. chores: jobs which must be done regularly (日常琐事). 5. Pella Clothing Bank: a room in a city building where used clothing in good condition for further wear can be left, and which is then either sold for a minimal cost, or given to people who need it (派拉旧衣库，用来放置还可以继续穿的旧衣服以便低价出售或送给需要的人). 6. needy: having very little food or money (穷困的). 7. closets: cupboards built into the walls of a house from the floor to the ceiling for the storage of clothing (壁橱). 8. part with: give something to someone else (给别人). 10. food shelf: an area in the city where food may be collected and made available to needy families (食品架，收集食品的地方，并将这些食品送给贫困的家庭). It is free on an “honor system” in which those who say they are in need of food are permitted to take a certain amount of food without cost, each week. 11. contributions: items given voluntarily (贡献出来的东西). 15. plastic food storage containers: plastic containers of varied size and shapes which may be used to store food temporarily (塑料食品盒). Whenever I travel, I wear a strange looking necklace2 that people often ask me about. I tell them that it is my talisman1. What is a talisman? According to my dictionary, it is the following: “an object which you believe has magic powers to protect you or bring you luck.” American Indians3 and Eskimos4 also refer to such an object as a fetish5, “an object, especially a carved6 object, which is supposed to have religious significance or magical powers7.” I am in Hangzhou, China, now, so I wear it every day. Of course, according to my culture and my beliefs, I don’t believe in magical powers, but somehow, I feel good when I wear my talisman. 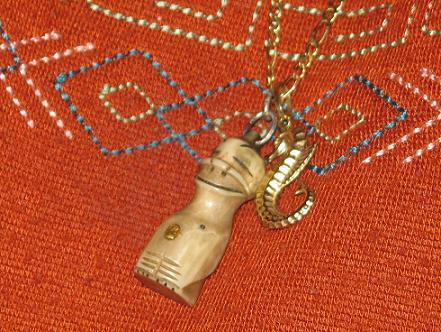 My talisman was carved from ivory8 by an Eskimo in Alaska9. It is supposed to represent an Eskimo traditional god, a billikin10, who protects travelers. It was given to me one summer many years ago when I was teaching at the University of Alaska. I have worn it when traveling since then. I feel very good when I do. It is a small talisman, about an inch long, with a tiny funny carved face, and a little gold belly button11. It is a friendly looking little god, and I like to think it’s truly protecting me. Coincidentally12, at the moment I am reading a paperback book that I brought with me to China. It is a mystery about a Navajo Indian13 police officer, a young woman who wears a talisman/fetish necklace to ward off evil. In the book she refers to it as a fetish of a badger14, a small wild animal which has a wide head and two wide black stripes on it. On the cover of the book there is a picture of her badger/fetish. When I first saw it in the book store, the picture interested me and made me want to buy the book. I also have another fetish, a carved turquoise bear15 that my son bought me one time when he was in Colorado16, a traditional American Indian area. I don’t wear it when I travel, but I often wear it at home because it is so pretty. It’s probably strange that I’m the one who wears such an item. I have absolutely17 no American Indian ancestry18. Don does, but he never wears such a thing, though we both have small representations of our Chinese Zodiac signs19 that we wear. Thus I feel I’m doubly protected by two very different cultural icons20. 1. talisman: an object thought to act as a charm to avert or prevent evil and bring good fortune (护身符，驱邪物). 2. necklace: a piece of jewelry that is worn around the neck (项链). 3. American Indians: native populations in North America who preceded the settlers from Europe (美洲印第安人，先于欧洲来的定居者之前的土著人群). 4. Eskimos: members of people of northern Canada, Greenland, Alaska and eastern Siberia (爱斯基摩人，居住于加拿大北部，格陵兰，阿拉斯加以及西伯利亚的东部). 6. carved: formed by cutting with a knife on wood, ivory, or other material (经过雕刻的). 7. magical powers: possessing the ability or strength to do something supernatural (神奇的力量，魔力). 10. billikin: a small carved image which is supposed to represent an Eskimo god (一雕刻物，是爱斯基摩人的神像). 12. coincidentally: occurring or existing at the same moment or time; occurs by chance (巧合地，碰巧地). 13. Navajo Indian: a tribe or group of American Indians located in the southwestern part of the U.S., mostly in Arizona and New Mexico (纳瓦霍族人，美洲印第安人的一个部落，大部分居住于美国西南部的亚利桑那、新墨西哥州). 15. turquoise bear: a representation of bear carved from a semi-precious stone called turquoise which is some shade of green with bluish or grayish tints (绿松石熊，由绿松石雕刻而成，呈青绿色). 16. Colorado: a western, mountainous state which is originally the home of many different American Indian tribes, and with many cultural artifacts found there (科罗拉多州，位于美国西部，多山，是许多美国印第安部落的最早居住地，有许多历史悠久的手工艺品). 17. absolutely: certainly so; without doubt; always true (绝对地). 18. ancestry: family background; forebears, line of descent in a family (祖先). 19. Chinese zodiac signs: characteristics or images for the twelve parts of the Chinese cycle of years (中国的十二生肖). As I celebrated another birthday, I couldn’t help1 reflecting on2 how one’s attitude3 changes toward his/her birthday over the years. I know mine certainly has.4 When I was young and growing up in the agricultural5 state of Illinois my mid-August birthday always coincided6 with the Illinois State Fair7, held in the capital city8 of Springfield, just an hour’s drive from my home town. My grandparents always enjoyed going to the state fair and so did I. What made it special for me was the big picnic lunch9 that my grandmother packed, including a rich chocolate cake with candles10 on it. When we arrived at the fair, we would head for11 the animal barns12, my grandfather’s favorite place to go, and then to the needlework13 and food contest14 area, my grandmother’s favorite. As a birthday present, my grandparents always let me ride on some of the carnival rides15, just as long as they weren’t the dangerous16 ones. Later on in the day, after our delicious17 picnic lunch, I would sleep in the back seat of the car until we reached home. Those celebrations certainly were special. As I grew older, I would want to be with my friends on my birthday. I know that my grandparents were disappointed18 that our annual trip to the fair no longer held the charm19 it once did, but that is a case of hindsight20 now. Friends and family still are the center of birthdays for me. This year Don was away in the state of West Virginia attending a mushroom meeting on my birthday, so my daughter Kim invited me to go shopping and to dinner with her in Des Moines. We spent most of our time in a large book store, browsing21 through books, a real joy for both of us. I had been given a gift certificate22 for purchasing books at that book store, and I had a whole list of books I was interested in. It was fun to browse, pick out a few books, and then sit in the coffee bar23 with Kim as we both decided which books we should get. bought a new one, THE SILK ROAD IN CHINA24 and one about the Navajo Indian code talkers25 and how they functioned during WWII. After we bought our books, we met some of Kim’s friends at a seafood restaurant, and I had their delicious clam strips26 and clam chowder27 (soup). I certainly didn’t want or need birthday cake after that rich meal. Monday son Jim came to have lunch with us. He also gave me a gift certificate for the book store. Now I have a good excuse28 to go there again soon. Last night my friend Barb invited us over for dinner as a “late” celebration, she said. Knowing how much I like soups and salads of all sorts, that is what she served. Again, I didn’t need a cake! I am happy to still have birthdays, of course, but best of all is that I have good friends and a great family to celebrate them with. Right? 4. I know mine certainly has: I know my attitude certainly has changed. 5. agricultural: having to do with farming (农业的). Illinois is a state with much rich farmland. 7. Illinois State Fair: name of large annual basically agricultural exhibits along with recreation and food booth held in most agricultural states in the U.S. (伊利诺斯州集市，美国大多数的农业州都会举行每年一次的集市，以农商品为主，还有娱乐活动和吃食摊点等). 12. animal barns: large barns where horses, cows, pigs and sheep are exhibited (展出马，牛，猪，羊的大型牲口棚). 13. needlework: handwork done with needles of several types (用各种针线缝制的东西). 24. SILK ROAD IN CHINA (中国丝绸之路): a book written about the road taken by silk merchants carrying their merchandise to the Middle East and exchanging it for Middle Eastern products, particularly spices and technology. 25. NAVAJO INDIAN CODE TALKERS (纳瓦霍印第安语密码): a book about American Indian language being used during WWII to confuse the intelligence operations of the Axis nations. 27. clam chowder: a thick soup prepared with clams cooked with milk or cream (蛤蜊浓汤). 28. excuse: a reason which may or may not be real ( 理由，借口). Here are a few things I learned about ice cream in yesterday’s newspaper article. Its origins5 supposedly6 go back to the 4th century B.C. when the Roman emperor Nero ordered ice brought from the mountains and mixed with fruit. Later Marco Polo took the Chinese method of creating ice and milk mixtures to Europe in the 13th century. It became a fashionable treat in Europe and was served by Early American presidents, who favored7 vanilla flavor8. The first ice cream shop opened in New York City in 1776. George Washington9 liked ice cream so much he reportedly had a bill for $200 for ice cream one summer. Vanilla remains the top ice cream flavor10 in the U.S., followed by chocolate and different fruit flavors. The first ice cream cone11 was made, served, and eaten in New York City on Sept 22nd, 1886. According to surveys12, it is the favorite way for people to eat ice cream. 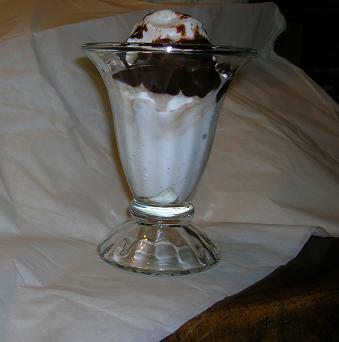 Many people also like ice cream with a topping13, chocolate or chocolate fudge14 being the favorite type. In addition, many people like nuts on top of the chocolate. On our travels between Idaho and Iowa there is a stop we always make. It is a big restaurant and gasoline station in western Wyoming, called Little America15. There the traveler is invited to get a big ice cream cone for fifty cents. Don always gets vanilla and I get chocolate. 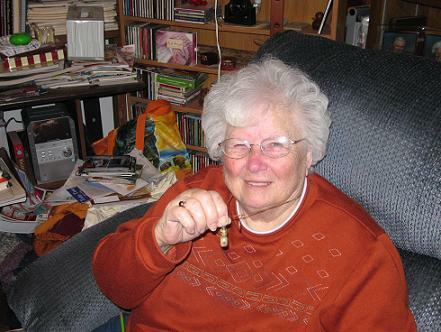 Kathy gets a mixture of vanilla and chocolate, and we each share with our dog Blitzen. I think we will make that stop two weeks from today when we head home to Iowa. 1. treats: special dishes or food that tastes good, especially one that people do not eat very often (款待，乐趣). 2. National Ice Cream Month: the month of July has been the focus of special attention to ice cream, probably because July is one of our very hot weather months in the U.S.
3. decree: an official order or decision, especially one made by the ruler of a country (政令，法令). 5. origin: beginnings, starting point (起源). 6. supposedly: according to popular belief or thought; alleged to be so (据说，据认为). 7. favored: preferred, liked best (最喜欢). 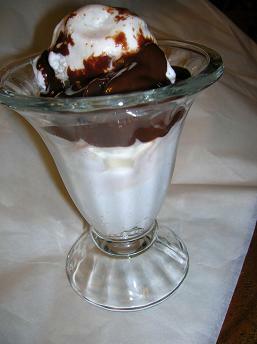 13. topping: items such as nuts, fruit, or flavored syrups poured on top of ice cream (浇头). 15. Little America: the name of one of a small group of large rest areas, restaurants and motels located in western United States. All offer special ice cream cones. The term “comfort food” has been on my mind for the past week or so because of conversations I’ve had with good friends here in the U.S. and an email from a very good friend in China. It all started one evening when Kim’s friend Mark was here for dinner. We were eating baked potatoes8 (among other things) and I mentioned that for me a nice baked potato was my number one comfort food. Mark said it was close to that for him but his top comfort food is tuna fish and noodle casserole9; Don said his is a big egg sandwich10 and Kim said that hers is a nice piece of cheddar cheese11. A few nights later when we were having a meal at the home of a friend I mentioned the conversation, and everyone there had comfort food selections too. I also mentioned this in an e-mail to my good friend in China. She answered back that she didn’t know the term “comfort food” but that she could guess what it meant; then she went on to tell me the favorite comfort foods of both her husband and herself. She also asked me if “comfort food” is a general term or just a regionalism12 here. I thought it a general term, so was happily excited to see it on the big roadside sign. In fact, after we crossed the Mississippi River13 into the state of Illinois, I saw it on another sign as we approached Springfield14, our destination. This morning I decided to see if the term is in the dictionary. I went to my favorite dictionary, MERRIAM-WEBSTER’S COLLEGIATE DICTIONARY 10TH EDITION. Sure enough15, there was a listing for “comfort food” and the definition was “food prepared in a traditional style having usually nostalgic or sentimental appeal16.” I think that is a good definition for my understanding of the term. I think of baked potatoes as delicious food, but I also associate them with my happy childhood memories17 of when my mother would bake them on a cold winter night. We would come into the house after playing in the snow, would sniff18 their delicious odor, and then happily anticipate19 the meal to come. This week is Thanksgiving week20. Many items of comfort food will be on the menu21 in many homes Thursday. Since I won’t fix baked potatoes (my children like escalloped potatoes22 on Thanksgiving) my real comfort food will be pumpkin pie23; Don’s will be turkey24 as well as cranberry salad25. Kim’s will be pecan pie26 and Jim’s will be green bean casserole27 and turkey. This will truly be the week for comfort food throughout the United States, but it will not be the same everywhere. Friday I read an article in a newspaper about Thanksgiving dinner in Alaska.28 It said that this year in Alaska’s native villages29 there will be store-bought turkey along with native delicacies such as reindeer stew30, stuffed moose heart31, and whale-blubber salad32. For dessert there might be akutaq, which is whipped animal or vegetable fat that is mixed with sugar, berries and sometimes fish. I wish all of the Eskimos and Indians joy as they eat their comfort food, but must admit that theirs is very different from mine. 1. Illinois (伊利诺州): a midwestern state in the U.S. bounded on the west by the Mississippi River. 6. standard favorite types of food: common or usual favorite items of food in a restaurant. 9. tuna fish and noodle casserole (金枪鱼面条砂锅): a mixture of ingredients with meat, vegetables and pasta, placed in a baking dish and baked until ready for serving. A favorite type of family meal. 13. the Mississippi River (密西西比河): the largest U.S. river, extending from Minnesota in the north to the Gulf of Mexico on the south. 14. Springfield: the capital city of the state of Illinois. 15. “sure enough” coll. something is true, or appears to be so; mostly heard in the Midwest. 17. memories: events which one brings to mind from the past (记忆). 18. sniff: inhale aromas; as of food, land, etc. (嗅，闻). 19. anticipate: look forward to…(期盼). 20. Thanksgiving week: the week in November when Thanksgiving occurs (感恩节那周). 21. menu: a list of food that will be served in a restaurant or home (菜单). 25. cranberry salad (越橘色拉)：a mixture of the fruits of cranberry combined usually with pineapple and served in various ways. 26. pecan pie：a dessert made with a pastry crust in a pie pan, filled with a mixture of pecan nuts, spices, and sugar and baked in the oven (山核桃馅饼). 27. green bean casserole: a baked mixture of green beans, mushroom soup and onions [绿豆(蘑菇洋葱)砂锅]. 28. Alaska: the northernmost state of the U.S., just northwest of Canada (阿拉斯加，美国最北部的一个州，在加拿大的西北面). 29. Alaska’s native villages: small towns in Alaska where people native to the area, such as Indians and Eskimos live (阿拉斯加的土著村落，如印第安人和爱斯基摩人住的村庄). 30. reindeer stew: 炖鹿肉汤，a mixture soup made with the flesh of the reindeer, a large deer native to Alaska and Northern Canada as well as N. Europe. It is associated with Christmas and Santa Claus mythology where reindeer pull the sled in which Santa brings gifts to children on Christmas Eve. 31. stuffed moose heart: 麋鹿心煲，a dish prepared with the heart of the largest animal of the deer family, and which lives in North America from northern U.S. to Alaska and Canada. When you choose to dine at The Holiday Inn1 you have quite a number of options2 to suit your taste3. One thing you might not be fully aware of4 is the number of different kinds of mushrooms which find their way into our culinary selections5 from time to time. Mycophagy6 or the preparation and eating of mushrooms has become increasingly important in fine cuisine7. There are many types of mushrooms, and each of them has several ways in which they may be prepared or mixed with other ingredients8. 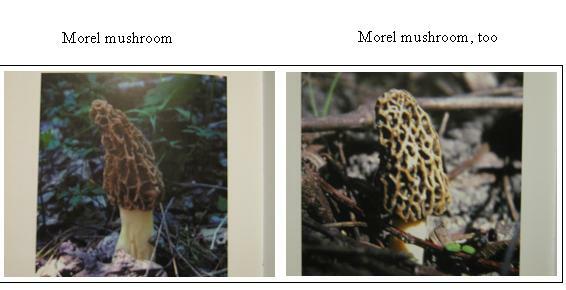 It’s now spring, and as you might expect, we’ve had morel mushrooms9 (Morchella esculenta) on the menu for a few weeks. Most morels are hand-picked from local sources to insure freshness and maximum flavor10. In other seasons of the year we can have morels which are commercially grown11, but these must be specially ordered12. The common field mushroom13, (Agaricus campestris) is our most commonly used mushroom in soups, sauces14, gravies15 and in salads or stews. This is the “button mushroom”16 you may associate with pizzas17 and mushroom soup, and we prepare it in other ways as well. What you may not know is that a variant18 of the field mushroom, the Portabella19, is the same type of mushroom, but it is grown to maturity20 instead of being used in the button stage21, and it is a larger variety. We also have Shitake (Lentinus edodes)22 in some of our veggie stir fries23 and soups, and may use “golden trumpet” (Cantharellus cibarius)24 which is so popular in Europe. Several other mushrooms are available, including the Oyster Mushroom (Pleurotus ostreatus)25, Wood Ear (Auricularia auricula)26, and the King Bolete (Boletus edulis)27, but you’ll have to special- order28 these. You may like to collect and cook your own mushrooms, but if you do, be careful that you know what you are eating! Some mushrooms are poisonous, and even some of the good ones may cause allergic reactions29 in some people. Eat a small amount of any mushroom if it is new to you, and in this way you’ll learn to appreciate them and may avoid an upset stomach30. 1. Holiday Inn (假日旅馆): The name of a widespread group of hotels and motels in the U.S. as well as other countries. Most of these hotels have excellent restaurants associated with them where both guests and local people eat. 2. options: possibilities, choices (选择). Most of these restaurants have large menus that list many main dishes, types of sandwiches, desserts etc. 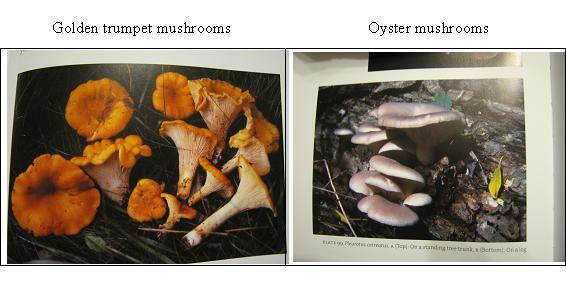 6. mycophagy: (a technical term) dining on mushrooms of various types (真菌的食用). 7. fine cuisine: extremely excellent quality of food prepared by a good chef (精美菜肴). 8. ingredients: the food contents of a special dish (配料). 11. commercially grown: (production of a food item) done by a business concern (专为出售培植的). 14. sauces: fluid, flavorful semi-liquid mixtures of foods and spices used to add more flavor to food (调味汁). 15. gravy (plural gravies): a sauce made from the thickened and seasoned juices of meat (调味肉汁). 16. button mushroom: another common name for the field mushroom. 18. variant: alternative form or different form than the more common one (变种). 19. Portabella: an Italian name given to the adult form of the variant of the field mushroom (长成熟的 field mushroom的意大利名称). 20. maturity: fully grown and developed in its life stages (成熟). 21. button stage: the immature stage of a mushroom when it has not yet developed distinctive parts of a cap, stem and base (蘑菇的未成熟时期). 22. Lentinus edodes (香菇): the Latin name for the choice edible mushroom known as Shitake in Japanese cuisine. 23. veggie stir fries (炒菜): a technique favored in Chinese cuisine. 26. wood ear (木耳): the mushroom Auricularia auricula which grows world wide on rotting wood of fallen trees. Prized as both a medicinal and highly sought mushroom in most Asian countries. 27. king bolete (牛肝菌): the mushroom Boletus edulis which is a large, fleshy mushroom associated with the living roots of many broadleaf trees including oaks. In Italy it is called Porcina which means “little pig,” because of its enlarged stem. Popular in many countries, and featured in many restaurants. 28. to special-order (专门订): order something which is not normally on the menu, but which can be ordered from a supplier who has this item available on request. 29. allergic reactions (过敏反应): responses of a person which cause them to become ill when eating a particular type of food. It occurs not because it is a poisonous food, but because the individual has a reaction due to their immune system response. It’s now sweatshirt and sweater2 weather. It happened this week. On Tuesday the weather was so mild3 that we broke the weather record4 for the date of the 28th (Don’s birthday). When friends came for dinner and to celebrate with us, one of the big topics of conversation was how warm it had been that day…66 degrees F5. However, we also discussed the fact that things were to change the next day when a cold air mass6 from Alaska and Canada was scheduled to arrive. The weather forecasters7 were correct and on Wednesday, the 29th, the temperature dropped 34 degrees F. during the day. I like to wear sweatshirts when it’s cold. They are comfortable8, warm, and colorful. Some of mine are seasonal9; others are humorous10; still others remind me of interesting places I have been. For Autumn I have several that have Autumn leaves on them. Of course, I have about four different ones with Christmas motifs11 on them. I even have one or two pastel12 colored shirts with spring flowers on them. Iowa is cold enough that I can wear sweatshirts from November (sometimes October too) through May. 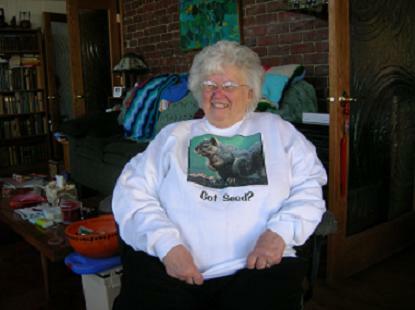 As for humor, one of my favorites is a white sweatshirt with the photograph of a squirrel13 on it. The squirrel is sitting on a tree branch, eating out of a bird feeder14. Below the picture are the words, “Got seed?15” Most people who see this recognize the question as a parody16 of a widely used TV commercial17 “Got milk?” which shows nice looking people with milk “mustaches18.” This commercial is sponsored by The Dairy Council of America19. Kim gave me the sweatshirt because I love to feed the many squirrels in our back yard, as well as to laugh at their gymnastic antics20 as they rob our bird feeders of seed. Kim gets irritated21 with the squirrels because she is the one who fills the bird feeders and she has to do it rather often because of the amount the squirrels eat. However, our squirrels are fat and happy so I don’t think she cares too much. Tomorrow when we go shopping in Des Moines we plan to buy two 20-pound bags of bird seed (perhaps even four) as the price for it is one of the advertised specials22 at the home improvement store23 that Don likes to shop in. I might even get some dried corn, as squirrels are especially fond of that. When the snows finally arrive, we want to keep all of our backyard wild life (squirrels, rabbits, birds, and an occasional opossum24 or raccoon25) well fed. I mustn’t forget about the sweatshirts from special places. One of the oldest ones I have is one I purchased at The Great Wall the first time we visited that wonderful structure. It says, “I climbed the Great Wall,” and I was very proud and pleased that I did go a long way up it. That was fifteen years ago. My problem now is that it is much too small. I forgot once when laundering26 it and put it in the drier27. Sweatshirt material will shrink28 a lot when put in the drier. A sad mistake indeed! I really should get it replaced some time.29 A sweatshirt that I bought last year came from The Smithsonian gift shop30 in Washington, D.C. It has a traditional American Indian design on it in honor of the new Indian museum complex31 which we were visiting. I am being very careful when I launder it (as well as my other favorites) now. I use cold water and hang them to dry. I’ll be wearing them now until May so want to take good care of them. 7. weather forecasters: people who predict the upcoming weather on the basis of highly technical information (气象预报人员). 9. seasonal: having to do with a particular season, i.e. fall, winter, spring or summer (季节性的). 10. humorous: funny, causing one to laugh or smile. 11. Christmas motifs: designs or pictures such as a Christmas tree or Christmas stocking, etc. (圣诞节图案). 14. a bird feeder: a container with seeds and food for wild birds (盛鸟食的装置). 15. Got seed? : Do you have any seeds? 16. parody: a humorous imitation of something or somebody that is well known to the public [(对大众熟知的人或物的) 滑稽模仿]. 18. “milk mustaches”: a deposit of milk on the upper lip which resembles a mustache (牛奶胡子). 19. The Dairy Council of America: an organization involved with the production and distribution of milk and milk products (美国乳品委员会). 21. irritated: bothered or mildly angered by some word or action ( 讨厌，烦人). 24. opossum: one of various small animals from America and Australia that have fur and climb trees (负鼠). 25. raccoon: a small North American animal with black fur around its eyes and black and grey rings on its tail (浣熊). 26. laundering: washing clothing items either by hand or by machine (洗衣). 27. drier: a machine which produces hot air to dry clothing (烘干机). 28. shrink: become smaller in size (收缩). 31. complex: a group of associated buildings (综合建筑群).